This candy tote bag is fun to make. I got a couple of Fat Quarters with halloween them on my trip to Seoul last year. The Korean cotton is a dream to work on. The fabric is just fab!! 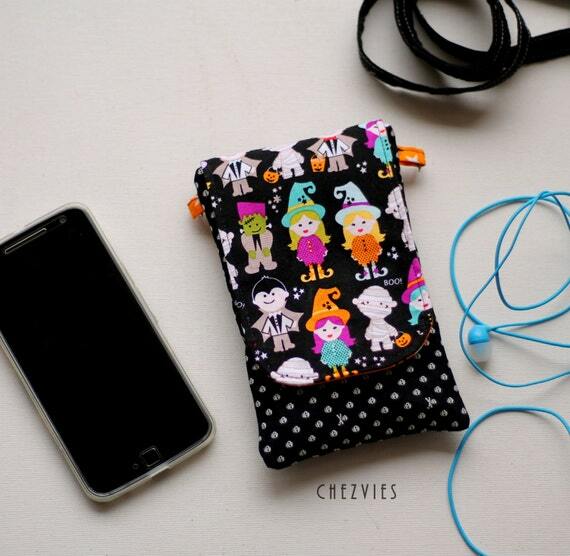 From the left over fabric, I made this cute mobile phone sleeve. The mobile phone pouch is quite popular in my Etsy shop and I've been making lunch bags and phone pouches for my local customers in the past few weeks. So,make sure you check the SHOP for newest updates and ready to ship items. The past few weeks, I've been busy setting up new platform for my shop. I've been selling in Etsy for a couple of years but with the ever changing Etsy policy it is getting tougher for sellers outside USA to get (even) a view unless we pay for Etsy Promoted Ads. Etsy promoted ads gives benefits, but I see that you should have a higher budget (which I can't afford) which bring your shop to the first search pages. Well, there are SEO thingy and keywords, etc which turned out to be a little help (or no help at all) if you don't use promoted ads. And also the "shop local" policy really have impact on Seller outside US. Another reason was I've been waiting for Etsy to introduce INR in their default currency but don't see that coming. While I get many inquiries from India, the USD price tag deter them from Etsy. Indian shoppers feel more comfortable shopping in their own currency and using Bank Transfer as mode of payment. I really wish Etsy take a hint from Amazon. There are many Etsy-like platform coming up in India, the problem with these marketplace is they withhold the payment to seller. For big player, a couple of bucks won't hurt them, but for us who make one product at a time and getting the money weekly or three quarterly is too much. With that in mind, I decided to sign up with Ecwid and have my shop everywhere. You can shop from Facebook or from my new shop blog. What I like most is it's user friendly and it has a FREE plan. I started with free plan then decide to upgrade. I will still be selling in Etsy. Ecwid is easier for me to connect with local shoppers and also with Ecwid I can offer a less price since I don't have to pay for the fees that Etsy charges. Please come and visit my SHOP and wish me a lot of good luck ^^. I have this orange batik for a long time. It's one of those modern batik depicting Jakarta's landmarks and cultures. I always wanted to make bag with it but could not find a perfect pattern for it, until last week! Well, Noodlehead pattern is always my favorite and this 241 tote was on my wishlist. I am glad I finally made it. the slanted exterior zipper pocket is so cute and perfect to keep your bus/train card or small changes or even your hotel card when you travel. I will definitely take this sling bag on my next trip. So, when you're planning your next holiday, don't forget to grab one of this bag.